In this post I will be covering the barriers to good Situational Awareness (SA) and how to overcome them. I will explain what those barriers are, their signs & symptoms and how to overcome them so you can acquire and maintain good SA during any emergency, disaster or “grid-down” situation your family find itself in. First, you must understand that people seldom realize they are losing, or have lost, their SA until it is too late to make significant corrective action(s) for both mission accomplishment and team member safety. Second, to maintain your SA requires a physical and emotional commitment to pay attention. The “what” you must pay attention to is not always obvious or instinctual; Most people’s attention focuses on, or gets distracted by, things that are loud, moving, or shiny/bright or that which are close to you; especially in your personal space. The number one barrier, without any doubt, to high quality and accurate Situational Awareness is “communications.” However, there are more barriers than just communications. However, all SA barriers can be broken down into to basically two categories, physical and emotional/mental. 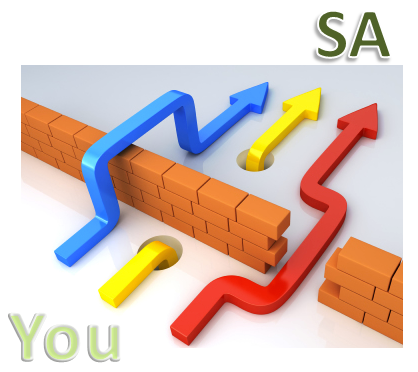 The physical barriers to SA are actually easier to identify and easier to deal with than the emotional/mental barriers. However, a lot of attention has to be applied to both. And the biggest contributor in the emotional/mental area is “ego.” You must be willing to admit that you aren’t perfect; you don’t know everything and other people can be smarter than you. That humble ability at least opens you up to recognizing the other barriers as they occur. Communication – Hardware.Here we are talking the communications equipment itself, the stuff you use to communicate with others. Whether it is radios, cell phones, signal mirrors or any other piece of equipment that is used for communicating. If it is broken, not compatible, incorrectly configured or people don’t know how to use it then communications immediately begins to break down. Once information exchange is delayed or absent SA suffers or completely disappears altogether. So how to overcome this barrier? Test all communications equipment prior to use. Train everyone on how to use the equipment. Anticipate that the equipment will fail, have alternatives and options. Something as simple as spare batteries, solar battery charger, or whistles to use if radios are non-functioning. You can also have a Standard Operating Guide (SOG) that states if you lose communications with your leader/subordinate you will immediately do “X” or “Y”. Then train in scenarios where communications fail. Communication – Quality & Quantity.The mitigation to this barrier can be a bit tricky. When overcoming the communication barrier to SA you have to know one important thing – relevance. The information you are communicating must be relevant to the both the mission and the environment; then it must be communicated clearly, concisely, and assertively. But it almost always must be done in the short conveyance possible. Use as few words as possible to communicate the relevant information. Sometimes “words” aren’t even needed. It is common that in the field that distinct “double clicks” on the radio means “acknowledge” or “copy” rather than speaking the word. Don’t communicate information that is not pertinent nor relevant. Don’t over-communicate; keep messages short, no “narrations” or “stories” when passing on information in the field. Staffing (under staffed, level of training).The number of people assigned to the task/mission must be realistic for a successful outcome. Too many and people get in the way of each other. Too few and people become overwhelmed or overworked. That usually results in tasks going unaccomplished. All personnel assigned to a specific responsibility related to the task or mission must be trained to successfully perform that responsibility. To help ensure mission accomplishment it is best to have personnel cross-trained in one or more other responsibilities to assist as needed. Tunnel Vision.People naturally want to simplify a complex problem, derive a simple solution and then reduce the amount of incoming information to support the simplified solution. And in doing so people tend to gravitate to their own areas of expertise or comfort zones. And while all that is happening we also tend to reduce, or eliminate, alternative solutions that may be far better than the solution we have fixated on. This is commonly referred to as tunnel vision. The term “think outside the box” has a lot of merit to it. The best way to avoid tunnel vision is to ask those around you what they think of your solution or vision and then accept their honest feedback without becoming defensive. In a High Reliability Organization a leader will defer to others for their expertise in areas where the other person exceeds their own training and knowledge. you are seldom able to acquire and maintain SA. You may acquire/maintain enough SA to accomplish the task/mission successfully but you must stay cognizant of where your breaking point is. Reaching that breaking point, as it relates to your SA, can lower your ability to accept inputs enough to jeopardize you and your team. Another example is adrenalin. Adrenalin is a two-edged sword; it can cut both ways – good and bad. Adrenalin affects you physically and mentally in extreme ways; there is little middle ground to the effects of adrenalin. When humans find themselves in life-threatening situations our genetic programming will put us into a “adrenalin rush” pumping that chemical into our system. Essentially the “rush” allows us to “fight or flight” with enhanced capability that exceeds our normal human capacity or capability. Physically we find ourselves able to breathe in more air, pump more oxygen to our vital organs; our muscles become stronger, etc. That gives considerably more ability to fight the threat or flee from it faster than we normally could. The down side to the adrenalin rush is we lose a whole lot of our ability to think logically. Essentially we are stuck with the tunnel vision of fight or flight. Only physical training, simulation training and experience can get us past the effects of the adrenalin rush forcing tunnel vision on us. “Stop, take a deep breath” has been uttered a billion times to people under stressful situations. There is a reason for it. When we find ourselves in an adrenalin rush or any stressful situation you must recognize what is happening. You must stop yourself from making a knee-jerk reaction, calm down, regain your composure and force yourself to think through a situation. The easiest “health” related barrier breaker to implement is; 1) stay hydrated, 2) eat right, and 3) get enough sleep/rest. Do not neglect these three basic mitigation actions and you are well on your way to overcoming the “health” barrier to good SA. surprises. We like others to be dependable and situations to be simple and what we expect to see. Unfortunately that is a death sentence for dealing with emergencies and disasters. When dealing with a task/mission, especially complex ones, events and actions may be well outside of the “norm” and completely unexpected. In some cases maybe even bizarre. As humans we don’t like that discomfort of the unexpected or conflicting inputs and emotions. We will naturally try to filter them through our biases to change them into what we do expect, usually something less scary or less unexpected. We tend to force them to conform to our view of how they “should be.” When doing so we will find ourselves distorting reality. Sometimes we will have a tendency to simply block out the event altogether if it becomes too unexpected. There is a definition and explanation for that. When we are presented with two or more sensory inputs that are contradictory to our expectations we can become very uncomfortable, that is called “cognitive dissonance.” In other words, our life just became very unbalanced and we hate that. So naturally via instinct or experience we attempt to restore balance. Unfortunately by doing so we will actively seek to avoid situations and information that increases bad SA. That means we will consciously or unconsciously shun anything that is causing the unbalance. And in doing so can make a bad situation way worse by ignoring reality. Overcoming Normalcy Bias barrier is the single largest challenge most people will face in life because it is the barrier that is the most entrenched into our human brain and DNA wiring. And it is such because it is a survival mechanism for our brains. You mitigate this barrier through training (classroom, self-study & simulation) and experience. Team SA is less likely to suffer from this barrier because you have more minds working on the same set of mission centered challenges and problems. Therefore you are more likely to have one of the team speak up and challenge the “norm” or have enough experience to have reduced cognitive dissonance. Competency Bias.This barrier is a function of “ego” pure and simple. It’s our view of ourselves and our abilities. It is our vision that we will always succeed. Or, alternatively, our vision that we are always better at something than everyone else. Simply put it is the thinking that we can’t lose because we are better or luckier. That could be we are better trained, better equipped, better people, better cause, or any other host of ego driven self-image visions of grandeur (delusions of grandeur). This barrier is best mitigated simply by understanding that there others out there better than yourself. A more formal methodology would be found in the High Reliability Organization concept of “preoccupation with failure.” Looking at any given situation you are in and thinking through the ways that you (and/or your team) could fail. Then taking steps to mitigate the factors that could lead to the failure. A good test to see where you are at with this; does anyone say about you “He thinks he knows everything.” If yes, you for sure should think twice about suffering from this barrier. Another stressor is conflict amongst team members. The conflict itself can become the primary focus of team members and the team as a whole. This tends to happen in teams that have little experience operating together. A leader who is not trusted or respected can also drive a team full of conflict. Whatever the reason the team members feel an overriding need to resolve the conflict vs. achieving mission success. Due to induced stress, whatever the cause, a person can get to the point where they are so stressed they will tend to suffer from cognitive dissonance and Normalcy Bias. When that occurs a common result can be the filtering of sensory input or becoming distracted by the activities that are not pertinent to SA. They also could simply “disconnect” and not accept any, or only limited, sensory input effectively incapacitating them. Mitigation is best achieved by having a team whose members know each other, have trained together and trust/respect each other. On the ground you can mitigate this barrier assessing which information is the most important and filtering out the less impactful. A leader can also ask for someone else to help with informational gathering and processing of specific inputs. concerned about mission accomplishment, often at any cost. While on the surface this may appear to be a positive trait, it is not. Caution should be given when a person expresses mission/task accomplishment “no matter what.” These people will tend to also suffer from Competency Bias and be so focused on succeeding they overlook the long list of ways they can fail. And not recognizing avenues of failure almost assures that they will follow one of those routes to failure. The best mitigation is well-trained, experienced leaders that have realistic expectations of success and can say “no” when needed. In high-risk, potentially lethal environment, this trait will often result in loss of life of team members. Culture (includes ethnicity & religion).There are human attributes that are attached to certain cultures and religions. However, do not confuse “bias” with these cultural and religious attributes. One cultural attribute that comes to mind is Native Americans to be less vocal, especially in groups or crowds of non-Native Americans. Also, there is at least one religion, Islam, that in some areas of the world have very diminished views of women and their roles. Even a culture that respects all life can be a barrier because they aren’t skeptical enough of other people; or, they will hesitate to take life when the situation demands it for self defense. The best mitigation to these barriers is to be aware that they can exist and have no predetermined image or vision of anyone. Treat everyone equally and that includes you. Ask other team members for an honest assessment of any cultural and religious barriers that you or any other team member might have. Putting these barrier breakers into practice can sound easy but in reality they can be tough to regularly implement. But training and experience can make it much easier to accomplish breaking barriers in the field. Having a mentor, especially a leadership mentor, can help dramatically. I will end this with saying again; High-quality Situational Awareness is of paramount importance.